Better late than never I always say. Other responsibilities have kept me from compiling and communicating the results of my trading during the month of March. In March I closed out 6 trades with a net profit of $1,084.20. The 6 trades required $72,835 in capital which means my ROIC was 1.488%. The average holding period was 42 days. (5) PG MAR $75 puts expired OTM. My CC trade was in AT&T (T). Back in January I had purchased 500 shares at $34.97 and sold CCs to capture the dividend. The calls expired OTM and I received the dividend. I then sold another round of calls and also sold puts at $33 and $32. I closed the position last week after both my puts and calls expired OTM by selling my stock at $34.86. All in all, it turned out to be a good trade. I also have a few trades that rolled over into April. I rolled my KMI $32.50 puts out from MAR into APR. I also have pen NP trades in CSCO and TGT. I am short the APR $21 and $57.50 puts respectively. My only new trades in MAR that remain open are FDO APR $57.50 puts and my most recent trade which occurred back on 3/27 where I STO NKE APR $72.50 puts at $0.75. (2) STO KO APR $37 puts. Well, that’s it for the month of March. Unless something big happens in the next couple of weeks it looks like I’m not going to have much to write about in April. Best of luck to all my trading friends. Happy New Year! While sitting in my easy chair and watching bowl games I’m going to take a moment to document the trades I closed in December. In December I closed 7 trades in 6 stocks, $VIX, ABT, ADM, CSCO, OKE, and RYN. (1) $VIX – This is one of the 3 trades that I closed for a loss in 2013. The problem with this trade is that I waited too long to roll out my long calls. Back on October 18 I BTO the JAN $13 calls. According to the rules of the trade strategy I should have rolled them out to FEB/MAR when the premium had decreased by 20%. Forgetting to do this, I let too much premium erode and when volatility did increase the increase in the premium was too little too late. My inattentiveness cost me $255.90. (2) ABT – On 12/31 I BTC 3 JAN $36 puts at $0.10. I STO the trade back on 12/9, selling the puts for $0.46. My ROIC for the 22 day holding period was 0.84%. (3) ADM – On 12/23 I BTC 3 JAN $39 puts at $0.24. I also STO this trade on 12/9, selling the puts for $0.63. My ROIC for the 14 day holding period was 0.86%. (4) CSCO – You’ll recall last month I told you about my setting up a put ladder in CSCO. I sold puts with JAN, APR, and JUL expirations at the $20, 19, and 18 strikes respectively. The objective of the trade was to eventually own CSCO at a net cost per share of < $20. Since executing that trade CSCO has ran up substantially greatly reducing the premiums in my puts. Consequently I decided to take some profit by buying back the APR and JUL puts. My ROIC for the 47 day holding period was about 1.64%. (5) OKE – This is the last of the 3 trades that I closed for a loss in 2013. It was a very small loss of only $12.85, but a loss nonetheless. This is a trade that I initiated back in May. My original intent was to sell puts and accept assignment to establish a long-term position at a price at which I was comfortable owning the stock. Events at the company caused the stock price to gyrate wildly. I mistimed my recovery trade and then was left watching the stock run away from me. I don’t have an interest in owning it at the current price so I chose to BTC my open puts for the small loss. If OKE returns to my buy range I may consider selling puts again. (6) RYN – Last up is Rayonier. This is a long-term holding of mine. Earlier this year they announced disappointing forward guidance and the stock sold off sharply. Rather than just buying more stock outright I chose to sell an ITM put. Doing so netted me $167.55. My ROIC was 3.72% with a 35 day holding period. Later today I’ll be updating the “Historical Results” tab to include the results of all of my trading in 2013. Yes, I have been very negligent in updating my blog. My results of late have not been anything to write home about and so I cut way back on my trading activity and am conversing regularly with my good friend Teddi over at www.fullyinformed.com to see how I might improve my results. However, that being said I do want to take a moment to document the few trades I did close last month. In November I closed 4 trades in 3 stocks, CSCO, TEVA, and YUM. (1) CSCO – 11/13 BTC 3 NOV $22 puts at $0.09. Netted a whopping $91.10 for a 1.38% ROIC with a 28 day holding period. (2) TEVA – 11/13 BTC 3 NOV $37.50 puts at $0.03. Netted $124.10 for a 1.10% ROIC with a 14 day holding period. (3) YUM – closed NOV puts at the $62.50 and $65 strikes. Net result was a small loss of $2.25. My only recent new trade was a put ladder in CSCO. I am now holding JAN, APR, and JUL puts at the $20, 19, and 18 strikes respectively. The objective of this trade is to eventually own CSCO at a net cost per share of < $20. I like CSCO’s long-term growth prospects and recent commitment to supporting a growing dividend. Finally, before signing off I’ll tell you I’m thinking of revamping my site to include updates on my long-term holdings. More on that later. You’ll recall earlier this year I started a new series of posts summarizing my monthly trading results. Today being the last trading day of the month let’s take a look and see how I did. OK, before I move on to the stats for my open trades, let me tell you a little more about these closed trades. All 4 closed trades were naked puts. Half expired OTM and half I bought back before expiration at a profit. I had CSCO puts at the $20 strike and POT puts at the $37 strike expire OTM. ITW and KSS I bought back early, both for $0.05. The return on invested capital for my open positions is much lower than normal because I did a poor job of managing them. I waited too long to roll out my GDX position. This resulted in having 300 shares put to me at $40. Because of this I was not able to generate any cash flow by rolling out my NPs. Neither was I reasonably able to sell covered calls on my new long position unless I wanted to sell them far, far out in time or way ITM. I also did a poor job of rolling out my open positions in CAT and NUE. While I was able to roll-out for net credits in both cases, they were small net credits. My other open positions are as follows: CSCO MAY $19, TEVA MAY $37.50, and CCJ MAY $19. I am cautiously optimistic heading into May. Best of luck to all my readers! You’ll recall a couple months ago I started a new series of posts summarizing my monthly trading results. The last trading day of the month being behind us let’s take a look and see how I did. OK, before I move on to the stats for my open trades, let me tell you a little more about these closed trades. Of the 5 closed trades, 3 were naked puts and 2 were covered calls. 2 of the 3 naked puts trades (CAT and INTC) expired OTM. The third, EXC I bought to close after 25 days (out of a total of 36 DTE) when I had captured 75% of the total premium. One of the two covered call trades (COH) started out as what one of my friend and investing mentors, Ron Groenke calls the “Double Up” strategy. This is where you do a covered call and sell naked puts on the same stock with the same expiration date. The other covered call trade (GLW) was a straight buy/write. All 5 trades were closed for a profit. The return on invested capital for my open positions is lower than normal this month because 2 of my 5 positions were initiated in prior months and did not generate any new income. One of the two (POT) was initiated in late February and the other is GDX which I have been trying to profitably work myself out of for a few months now. The return on invested capital for new open positions is a more normal 1.09%. Best of luck to all my readers as we head into April. OK, I was totally shocked and embarassed when I logged into my blog earlier this afternoon. I could not believe that 2 months had passed since my last post! Yes, I did realize that I had not been as diligent in posting every week (at a minimum) as I had in the past. However, I had no clue that I had let so much time slip past me since my last blog entry. So, let’s get y’all caught back up to date on my trading activities these past 60+ days. In looking back at my last posts I found that I had written about trades in INTC, CSCO, and CCJ. First, a quick update on INTC. As I mentioned in my previous post I accepted assignment on 500 shares at $24. My net cost on this position is $22.51. You’ll also recall I had a second trade open having initially sold a round of puts at the $22 strike price. Just prior to October expiration I rolled these down and out to the DEC $21 strike. Then, just prior to DEC expiration I rolled them out again, but not down, to the JAN $21 expiration. If the sell-off continues into the new year my plan at JAN expiration will be to once again roll down and out as necessary to obtain a net credit. It is likely that this will be the MAR expiration at the $20 strike. Next, let’s get you caught up on CSCO. You’ll recall I opened my most recent trade on CSCO back on 10/19 by selling NPs at both the DEC $16 and NOV $17 strike prices. The NOV $17 NPs expired OTM so I rewrote a new round of DEC $17 NPs. CSCO had a good run-up in late November and early December so I was able to buy to close both of the open DEC positions well before expiration. I currently do not have an open position in CSCO. Lastly, let me give you a quick update on CCJ. On October 12 I sold to open NOV NPs on CCJ at the $18 strike. Just prior to NOV expiration I rolled these out to JAN expiration, keeping the $18 strike price. CCJ recovered quite nicely in December and I was able to profitably close the position on 12/19 by buying to close at $0.05. As we start into the new year I hope to be able to get everything on my blog back up to date. My closed trades and open position pages are totally out of date. In addition I need to update the page explaining my trading plan. It no longer reflects how I identify and execute my trades. Best of luck to one and all as we head into what looks to be an exciting 2013. Earlier today I entered a new naked put position in Cisco (CSCO). Specifically, I sold to open (STO) 5 AUG $15 puts at $0.33. Net of commissions I will earn a 2.054% ROIC with 53 days to expiration. So, basically just over 1%/month. My down-side protection is 7.7% and my net cost if I have CSCO put to me will be $14.67/share. I want to own CSCO at $15 or less. Thus, my plan is to continue selling these puts until assigned. However, given the current market volatility I chose not to initiate a full position in one trade. I would like to eventually own 1000-1500 shares of CSCO so by just initially selling 5 puts I leave myself with ‘wiggle room’ should the shares continue to decline. If the market continues to decline by AUG expiration and my CSCO puts are ITM I may choose to roll them down and out and sell another new round of 5 puts at the $14 strike. 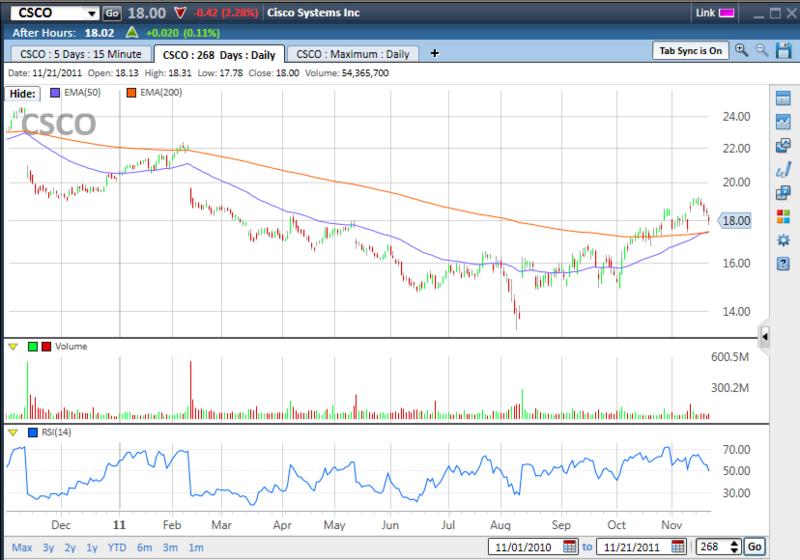 Why do I like CSCO at this price? Well primarily because it is significantly under-valued. It trades at about 8.5x forward earnings and has over $6/share in net cash on its balance sheet. That means that net of cash it is trading at 5.2x forward earnings! That’s dirt cheap for a company that is still growing, and has strong operating margins. To top it all off, last year it began paying a small dividend which now equates to an annual yield of 1.9%. The dividend payout ratio is a miniscule 19% so there is plenty of room for that to grow rapidly in the coming years, which is exactly what I expect it to do. Below is a 5-year chart for CSCO. You can easily see this is a very good entry point for establishing a long-term position. 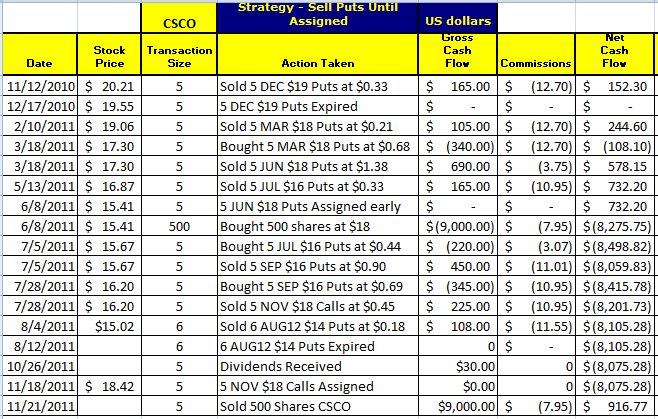 The purpose of this post is to share with you the results of my trade in CSCO. I started this trade about a year ago when CSCO was trading at $20.21. My strategy was to sell puts until assigned and then sell covered calls until they were called away. As you can see below, that is pretty much the way it played out. My results weren’t as good as I’d hoped as my overall objective is to average 1%/month or 12% annualized in my trades. My ROIC was around 10%. I might have done better had I been a little more aggressive at the beginning. You’ll notice I didn’t have any open trades between late December 2010 and mid February 2011. I also might have improved my results some if I had kept a closer watch on my puts and not have let them get so far ITM before rolling. Not doing so resulted in having the stock put to me early and then I had to wait for several weeks before I could begin selling calls against the position. Here’s a chart of CSCO for the period covered. I plan to initiiate a new trade in CSCO very soon. Currently, I’m considering the DEC $16 puts. I’d be interested in selling them if the market continues to drop and I can get at least $0.16 for them. You’ll recall last week I highlighted 5 of the 142 trades which met our NP Strategy selection criteria. Below are the ticker symbols, strike prices, and yesterday’s closing price for each of the 5 trades. As you can see all 5 of the trades I selected finished OTM. Thus far since I started sharing my Weekly NP Strategy selections I don’t think a single one of my highlighted trades has finished ITM. Now if I could only feel as confident as my record suggests I should. I find it very hard to enter these positions. I always find something to use to talk myself out of making the trade. I hope everyone has a great week. I want to let everyone know I’ve decided not to run the Weekly NP Strategy on the week before option expiration each month. There are no true weekly options this week. They simply are the regular options which expire on Saturday.